NextGen vs Epic EMR - Which EHR/EMR Software Wins in 2019? Both these EMR/EHR systems offer comprehensive and robust EMR capabilities including charting, vitals and measurements, prescription templates, ePrescribing, and more. Every system will have pros and cons, many of which depend on your unique practice requirements. 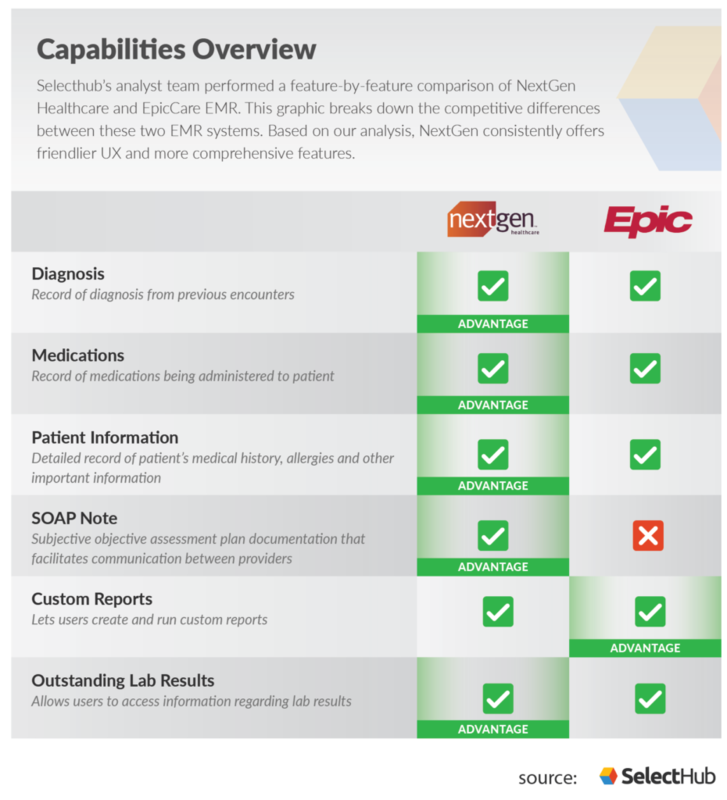 Here’s a brief overview of the advantages and disadvantages of NextGen Healthcare vs EpicCare EMR. NextGen Healthcare offers two scalable EHR solutions — Office and Enterprise — that are suited for a range of practices and hospitals.  It lets users customize the system to both specialty and industry needs. NextGen’s rich reporting features make it an appealing and competitive option for some practices. Some drawbacks to NextGen are typical to many EMRs. Some users report a complex and cumbersome UX interface, as well as slow upgrades that can bring the system grinding to a halt. Vendor support is also lacking in many reviews of this product. EpicCare’s EMR specializes in academic medical centers and large healthcare organizations — like my provider, Kaiser Permanente, for example — and offers an extensive range of services. 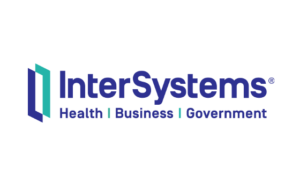 It is one of the most widely used healthcare IT systems in the US and covers hundreds of thousands of patients. Epic’s shortcomings come in the form of integration and price. Epic discourages its users from sharing data with any other software systems. It even charges a fee to send data to non-Epic platforms. This contributes to the price tag that pushes some users away. One benefit of utilizing an EMR over paper records is ease of recording. EMRs offer a problem list of symptoms that physicians can scroll through to select a diagnosis for their patients. The intention of this is to streamline the recording and billing process through standardization of symptoms and ICD-10 codes for those symptoms. EMRs, EHRs and medical practice management software should all offer some form of this capability, but the ease of use and comprehensiveness of this feature will vary. NextGen Ambulatory EMR provides its users functionality for recording diagnoses and encounters with patients. Users can find the diagnoses in the problems list by leveraging PFT and standardized codes such as SNOMED CT and ICD-10. In the encounter screen, physicians can quickly view numbers of allergies, problems, medications and diagnoses. Hovering over the problems tab of the encounter screen offers a chronic problems list, and the diagnoses tab gives physicians a complete list of all diagnoses made on previous encounters. The hover option allows users to effectively navigate through patient information without frequently changing templates or clicking away from the encounter note. EpicCare Ambulatory EMR allows users to record information related to a patient’s disease along with its diagnosis. Epic’s problems list contains all previous diagnoses information for a patient and is shared across all Epic providers. This information can be sorted to allow individual practitioners to view only the information relevant to them at a given time. This system combines review, documentation and order management features to provide a charting software that connects every member of the care team in a single interface. It can be cumbersome to sort through the entirety of a patient’s previous diagnoses, and the UX of this system is significantly less intuitive than that of NextGen. @NextGen #Healthcare rates better than EpicCare #EMR for Diagnosis in @SelectHub's research & analysis of the two #EHR tools. NextGen Ambulatory’s home screen allows users to work faster and smoother. Without navigating to another screen, they can see past HPIs, exams, assessments and plans, as well as review medications, allergies and past medical history. In the patient encounter screen, medications are listed along with the number of entries on that list, and physicians can access that information by hovering over it. By clicking, users are taken to the medication module, where they can make new entries or edit existing ones. EpicCare Ambulatory EMR monitors medication treatment by logging current and previous medications in the encounter screen. This log includes all medications prescribed across Epic providers and can be accessed via a pop-up window, reducing the need to click through different screens. While this is a useful tool, it retains all previous medications until a physician manually removes them. @NextGen #Healthcare rates better than EpicCare #EMR for #medications in @SelectHub's research & analysis of the two #EHR tools. NextGen Ambulatory EMR’s home screen lets users see past HPIs, exams, assessments and plans, as well as review medications, allergies and past medical history. NextGen Ambulatory also allows users to flip through charts with auto-grow grids. Physicians can utilize the patient information bar to access frequently-needed data such as age, date of birth, insurance carrier, address, etc. without interrupting their workflow. This solution allows users to hover their mouse over fields to view additional information without clicking away from their screen, a common issue for physicians. Within the patient encounter screen, users can also view patients’ primary pharmacy, rendering provider and primary care provider. EpicCare Ambulatory EMR allows users to record all of their patient’s information, including medical history, medications, allergies, laboratory/radiology results and more. Physicians can access this information from the encounter page via a popup window. Patients can access their medical records via a range of mobile apps, encouraging them to participate actively in their care. When considering the differences between NextGen and Epic, this system is clunkier than NextGen’s and according to some users has a steeper learning curve. Additionally, if a patient’s medical history comes from a non-Epic provider, that information cannot be accessed via EMR integration. @NextGen #Healthcare rates better than EpicCare #EMR for #patient #information in @SelectHub's research & analysis of the two #EHR tools. SOAP notes are a medical evaluation method that attempts to standardize the encounter between patient and physician. The goal of SOAP notes is to improve communication between all channels of patient care and organize that communication so it can be easily revisited later. Plan: Lays out provider’s plan for care such as tests, prescriptions, follow-up directions, etc. NextGen Ambulatory allows users to save an entire SOAP note without losing the format, and they can reuse it for common findings using “Quick Note.” Users can also retain their preferences for procedures and exams using “Quick Saves.” If users navigate away from or finalize their SOAP note, it will remain in the same format when you return to it, speeding up the learning curve and streamlining template use. Unlike many other EMRs, EpicCare Ambulatory EMR does not provide support for SOAP note. This is in part because of Epic’s proprietary data approach, which does not allow it to share data with non-Epic providers. Epic has its own encounter record of course, but it does not follow the standardized format of a SOAP note. @NextGen #Healthcare rates better than EpicCare #EMR for #SOAPnotes in @SelectHub's research & analysis of the two #EHR tools. Reporting was once the purview of strictly business intelligence tools, but that’s changing. As every form of software becomes more and more advanced (and, ironically, more similar to each other), they have begun to adopt elements of other types of software. One of the first elements to be added is often business intelligence/business analytics capabilities. EHRs/EMRs are no different in that way, and the ability to create custom reports can give healthcare providers new freedoms and insights. In the future of EMR, this capability will likely continue to gain importance. NextGen Ambulatory’s InSight Reporting allows users to set practice benchmarks, monitor progress, and gain access to insightful and actionable comparative analytics on peers and payers in real time. This allows practices to identify pain points in their daily operations — long lobby waits, high rates of individual physician error, financial overpaying, etc. — and better address them. Epic’s Epicenter offers a range of reports, both pre-built as well as query-based. Users can utilize Epic’s expansive databases to report on both clinical and financial data from multiple integrated Epic providers. Even users unfamiliar with other types of BI tools can make and understand these reports. This interconnectedness allows users to garner robust data sets and observe multi-practice trends in their reports. 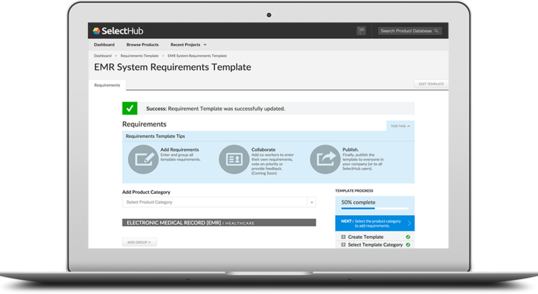 EpicCare #EMR rates better than NextGen #Healthcare for custom reporting in @SelectHub's research & analysis of the two #EHR tools. When a patient needs laboratory work done, that work is often outsourced from specialty labs or other external sources. Your EMR has to be able to receive those lab results and incorporate them into a patient’s medical record. How well an EMR does this varies, and if the integration isn’t smooth, it means more data entry work for your office staff. NextGen Ambulatory enables instant access to charts and lab results at any location. This instantaneous access without a paper chase allows continuous monitoring of a patient’s record. This means that physicians and office staff can act immediately upon new information with potentially life-saving results. Patients also benefit from this real-time access — they can see their results as soon as they’re in via a patient portal. They no longer have to wait days for their results to be processed and passed along. EpicCare Ambulatory EMR doesn’t allow direct data sharing, so its process is slower. Epic users have to route diagnostic testing results through the system to the appropriate caregivers manually, often via paper trails. While it still gets the job done, this more cumbersome process adds to physician overburdening and increases the downtime for the entire care team waiting on crucial lab results. @NextGen #Healthcare rates better than EpicCare #EMR for outstanding lab reports in @SelectHub's research & analysis of the two #EHR tools. While both tools are excellent — our analyst research put both in the top eight EMR solutions overall — there is a pretty clear winner when looking at Epic vs NextGen. Both offer the same features (with the exception of SOAP notes, which Epic foregoes completely), but how those features are delivered to end users makes all the difference. NextGen Healthcare is significantly more user-friendly than Epic and offers interoperability features that make it much easier to use with other systems. After comparing features, see how these two EMRs stack up in cost and compare the features of other EMR/EHR industry leaders. Now you should feel confident enough to find the perfect EMR for your practice. Did our analysis do these two EMRs justice? Do you use one of these systems? Let us know your thoughts in the comments! I use both EPIC and NextGen. There is no comparison. NextGen is horrible. EPIC is superior. Thanks for reading! It’s always good to hear from a firsthand user. Epic definitely has its benefits, this research reflects our analysts’ investigation of the software capabilities. This comes from a feature perspective and has a capability-specific focus rather than a user-experience focus. We’re sorry if that doesn’t reflect your experience!